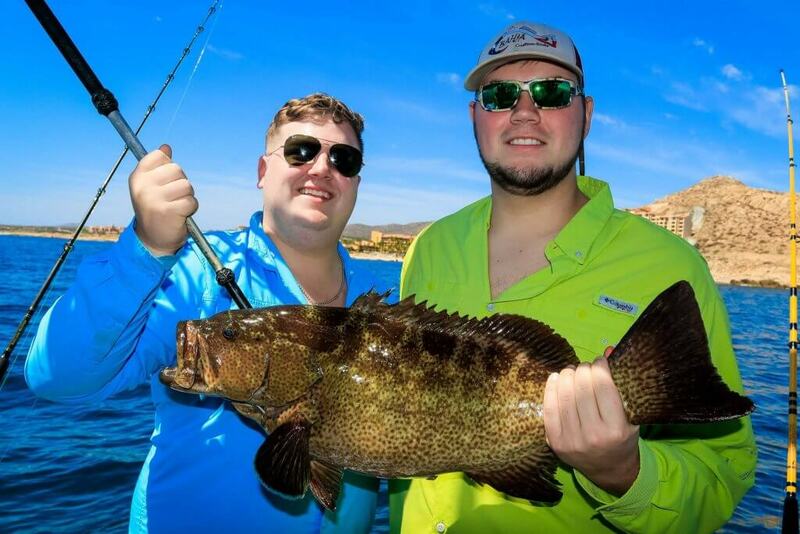 Cabo has a Jem of a fishing spot called Finger Bank. 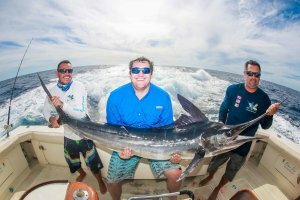 If you want to release over 60 Billfish in one trip, this is the one for you. 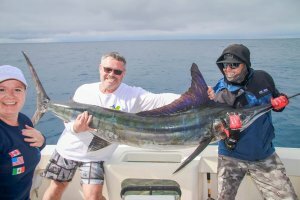 Not many fisherman get to accomplish this bucket list trip. 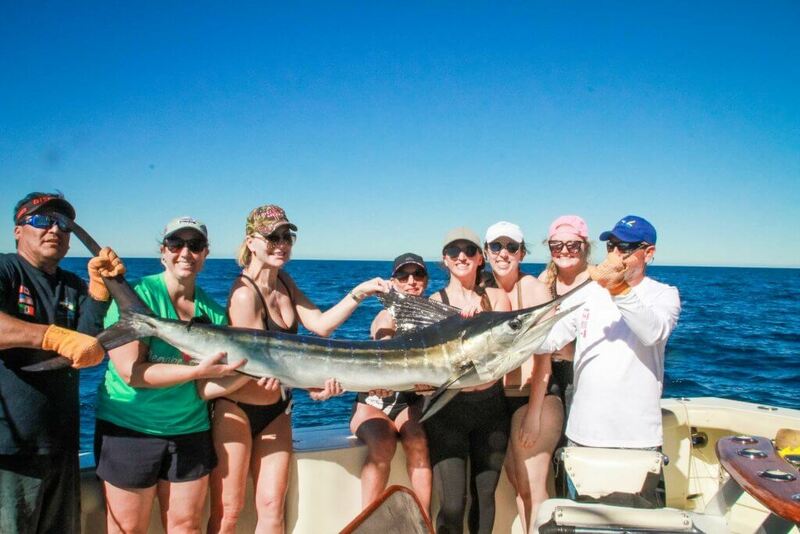 Finger Bank is located 50 miles from the Cabo San Lucas Marina. It is off the cost of Todos Santos, in the Pacific ocean. Captain Gilbert and his Crew prepare for a lengthy trip. Weather conditions couldn’t be any better, calm waters and shining sun. This was a time when pure exhaustion was the best feeling in the world. 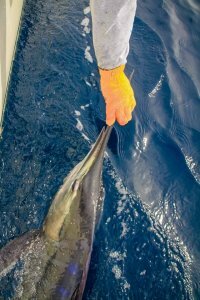 Every line had a bite, by the end of the day 32 Billfish were released. Captain Julio and his crew headed out on our 32′ Yacht Blue Water. 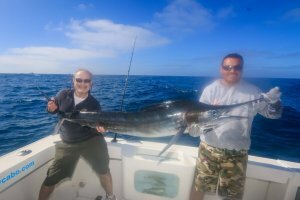 Marlin is on the list today, we always start with a slow troll out towards the Pacific. 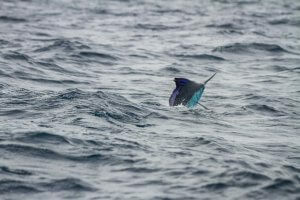 Head to the Marlin hot spot Golden Bank, it is 15 miles north of the Marina. 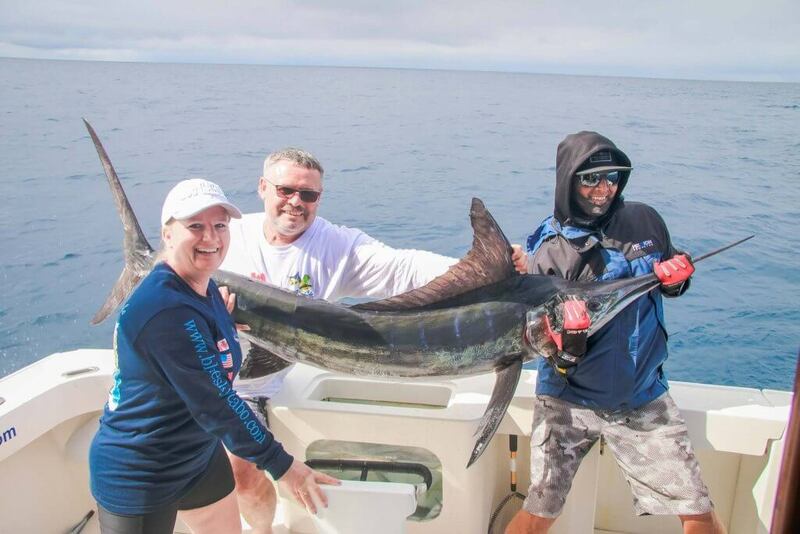 Landing this prize worthy Marlin. 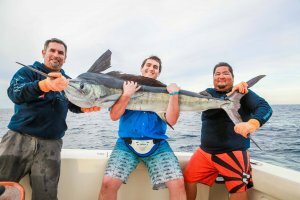 Here in Cabo catch and release is encouraged. Remember you can get a replica mount if you wish. We include a photographer on our charters to capture your day. Early with the sunrise, Captain Eddy and his crew departed the marina aboard the 60′ yacht blue sea. The sea was relatively calm, small swells and a slight breeze coming from the southwest. Taking this group out literally 100 yards from Lands End. 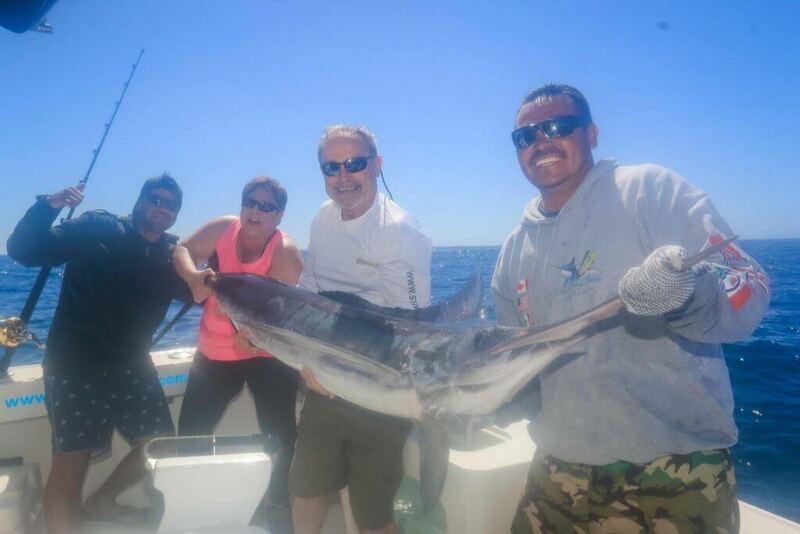 South into the Sea of the Cortez…traditionally a magic spot for Marlin. 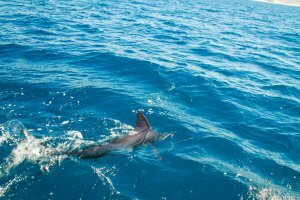 April is generally slow for Marlin…hit or miss. 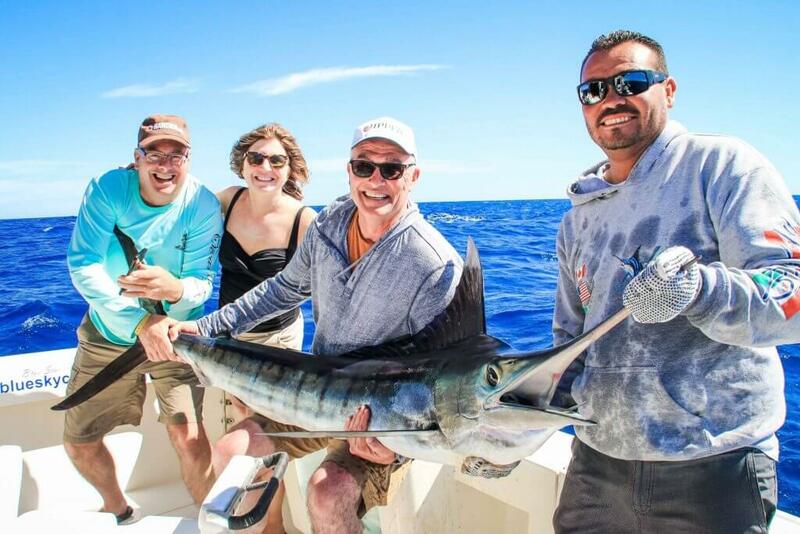 This group had an amazing day, not only catching and releasing the bucket list Marlin. Landing a tasteful boat load of fish, Red Snapper, Wahoo and Tuna. Early morning departure on 32′ Yacht Blue Star ,with Captain Julio and his Crew. Started out with a slow troll, heading east into the warmer waters of the Sea of Cortez. 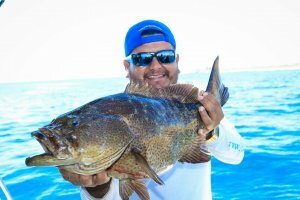 Trolling around rocks and coral is a good place to find bottom fish. 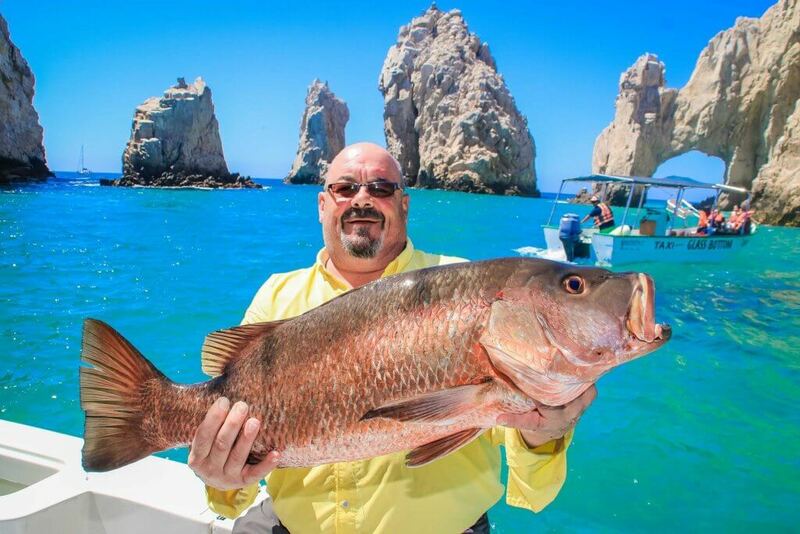 Cabo is know for some good size Snapper. Snapper are one of the many bottom dwelling fish. 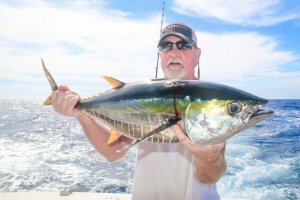 Just make sure you use live bait, they cant resist a fresh yellowtail mackerel. 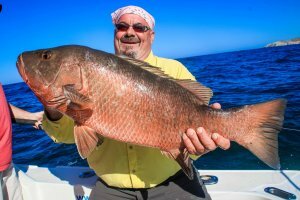 If you are lucky your live bait will entice a larger snapper. 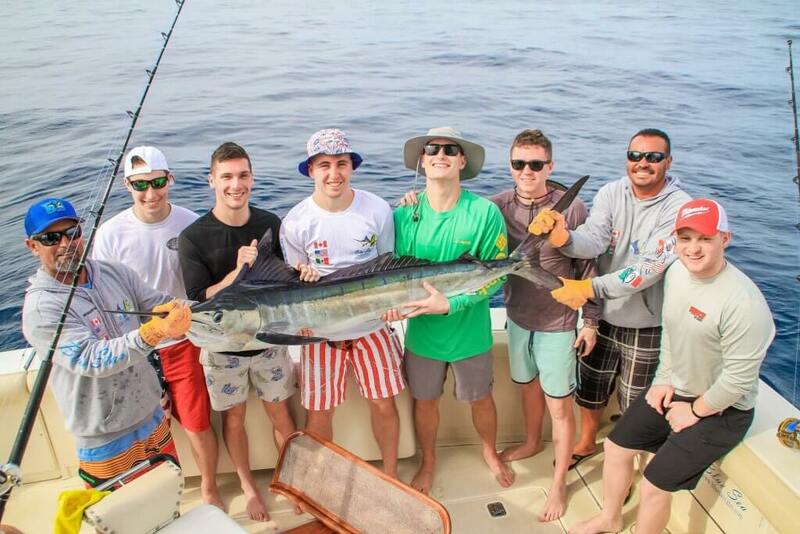 This lucky group was able to land this impressive one. Early morning departure on our 32′ Yacht Blue Star, with Captain Julio and his crew. Beautiful morning very calm waters. First area to check out is around lands end. Not much happening caught a few trigger fish. We decided to take a slow troll out by the Old light house. 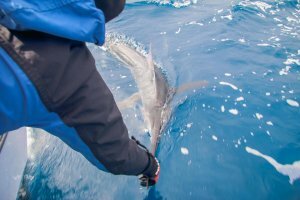 Not long before they landed a nice Marlin. It was an early morning departure for Captain Eddy and his crew. It was a very beautiful calm day for fishing ,from the 35′ yacht blue water. Trolling lines set…. slow troll out into the Pacific, up to Golden Gate Bank. One of the Best spots to catch some good size fish. 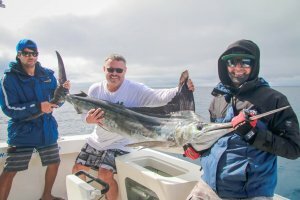 Didn’t take the group long to land a nice size Marlin. Snapper can be found from the Bahía de los Ángeles in the sea of Cortez, all the way to Bahia Tortugas in the Pacific. 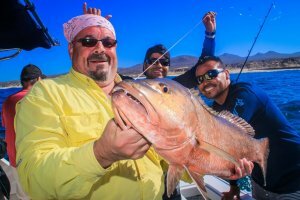 Pretty common catch in Cabo, Snapper are a good eating fish. 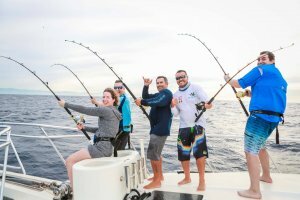 Captain Eddy and his Crew are guaranteed to find Snapper, in and around reefs and rocky areas. Captain Gilbert and his crew departed bright and early aboard the 60′ Yacht Blue Sea, in search for Marlin. 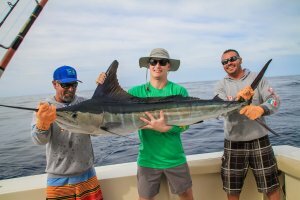 Generally the best area to start looking for Marlin is just a 6 miles from the El Arco. They set trolling lures on outriggers and slowly headed 2 miles past El Arco by the light house. 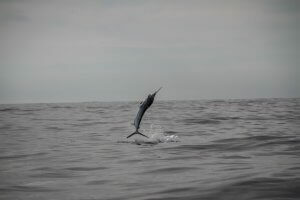 It is one of the best areas for a reason, didn’t take long before landing a Beaut of a Marlin. Caught and released this Beaut of course. Our 35′ Yacht Blue Water, departed the marina with the sunrise. 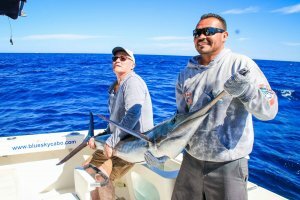 Captain Eddy and his crew are in search for some good eating Tuna. Ocean conditions were relatively calm, moderate swells. 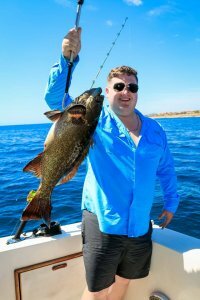 Trolling closer to shore over the rocky areas in the Sea of Cortez. Having a slow start, we ventured closer to Santa Maria Canyon. Much better luck, landing some really nice yellow fin. 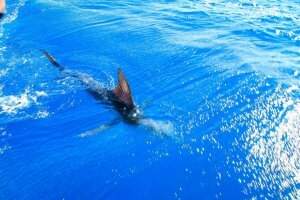 What’s the best time to book your Santa Maria snorkel tour aboard one of Blue Sky’s yachts? 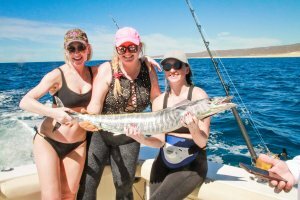 Others choose to book their Santa Maria snorkel tour later in the day so they can spend part of the time in the water and the other half of the time aboard, enjoying the Sea of Cortez and the many sights. A late afternoon Santa Maria snorkel tour could also include watching the spectacular sunsets as you are lulled by the motion of the waves. Your Santa Maria snorkel tour starts with an exciting ride on board one of the Blue Sky’s luxurious yachts. 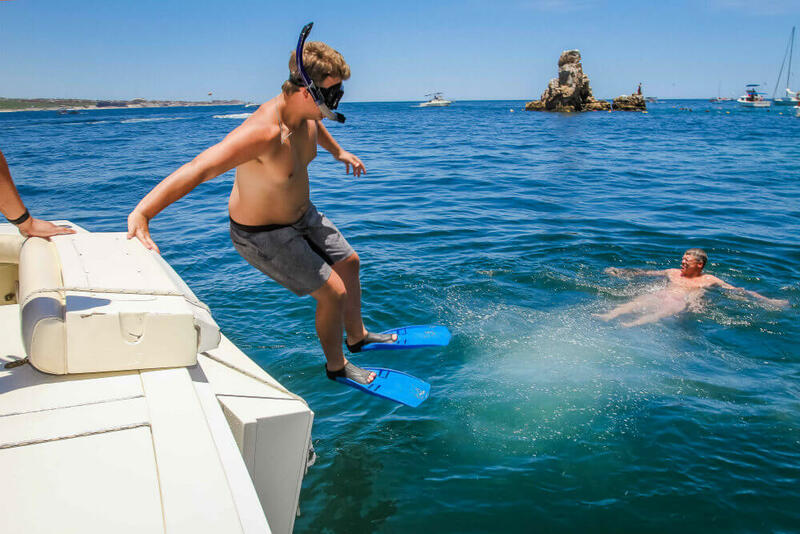 You will cruise past famous Cabo San Lucas landmarks such as El Arco and the sea lion colony, hidden coves and beaches on your way to have the experience of your life with the ultimate Santa Maria snorkel tour. 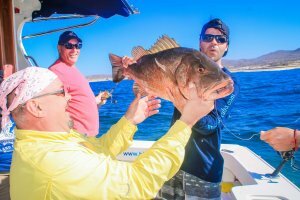 We’ll cruise along the Lands End peninsula and El Arco (The Arch), past Lovers’ Beach and straight to the famous Cabo Arch where a colony of celebrity sea lions lives. 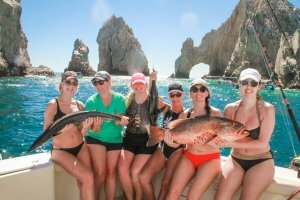 It’s not a complete Cabo snorkel tour if you don’t get a fabulous photo of you and your group in front of El Arco. At Land’s End, pelicans love to roost on Pelican Rock and the seal lions will greet you with loud barks as they swim and play in the water. In Cabo San Lucas, the Pacific Ocean meets the Sea of Cortez here – “Lands End”. Aquatic life in between oceans travel here to dine on the nutrient rich water so even as your Santa Maria snorkel tour hangs out close to the reefs, we frequently encounter larger animals. 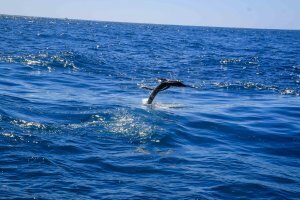 Humpback whales have even been known to swim up to the entrance of Marina in Cabo and follow the boats along their ocean cruises! Whale season ends in April, but don’t worry you may see dolphins and skate breaking the ocean waves! You will also find the usual tropical fish families such as: Angel fish, tangs, puffer fish, porcupine fish, trumpet fish, damsels, butterfly fish, wrasse and many, many more. 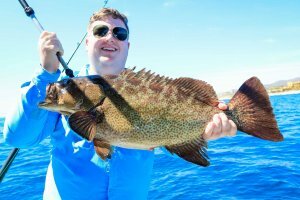 The Los Cabos area is home to an amazing variety of fish life. 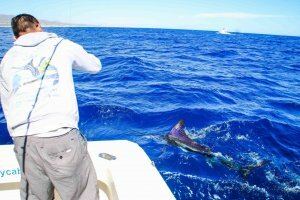 The water is clear, and as well as lots of reef fish, you may spot sea cucumbers, sea urchins, sea stars, crabs, sting rays schooling mobula rays, turtles, sea lions and pelagic fishes. There are usually lots of colorful tropical fish here too. 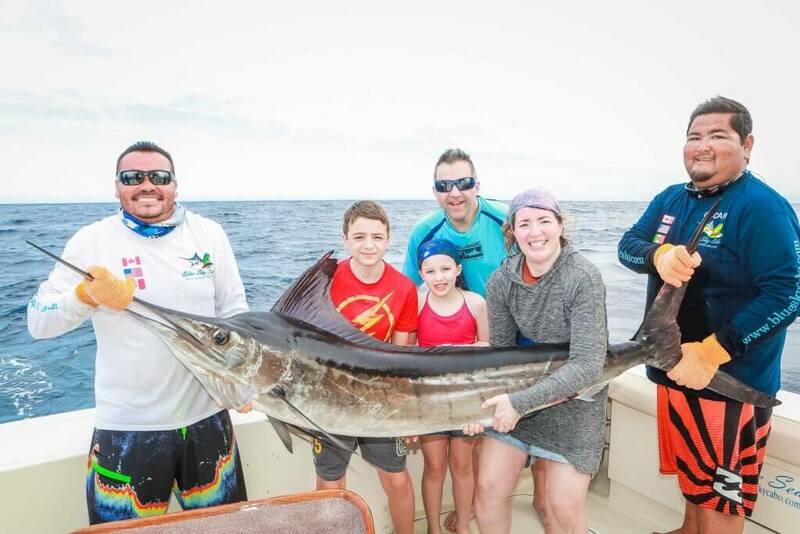 We will cruise past the Arch on our way North to Santa Maria Bay, drop anchor at this spectacular location where you’ll swim, snorkel and have time to relax as part of your Santa Maria snorkel tour. Protected from ocean swells, the water is usually calm at Santa Maria Bay, great for beginners and experienced snorkelers. During your Santa Maria snorkel tour, you can elect to have the tour include food and drinks to be served. Our crew will take care of all your needs, from Tacos to Tequila. And, we always have fresh water available to keep you hydrated! 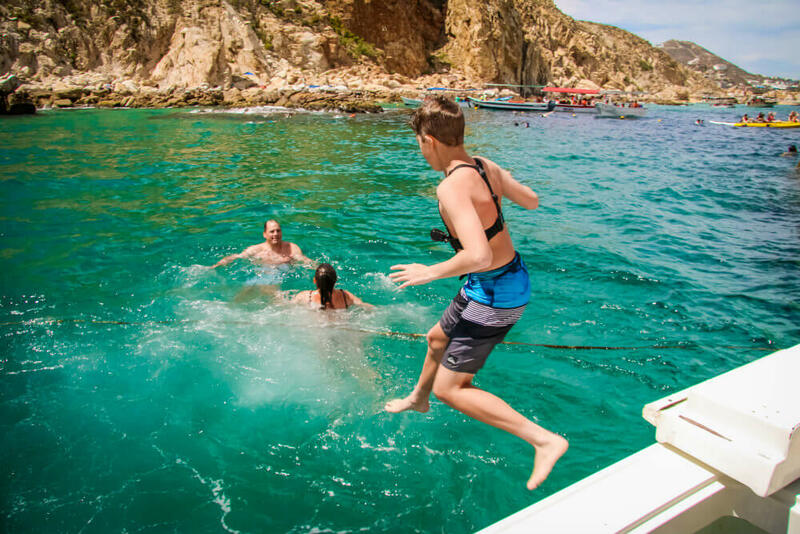 Before hitting the water, your Santa Maria snorkel tour includes an instructional briefing concerning basic boat safety, in and out of the water. When you embarking on your Santa Maria snorkel tour and cruise, typically flippers, masks, snorkels and life jackets will be provided. You may be required to wear a life jacket at all times, even if you’re an experienced swimmer. Be sure to bring a waterproof camera, sunglasses, swimwear, non-slip shoes, towels and sunscreen. We suggest water proof sunscreen like BullFrog, that stays on all day, in and out of the water. Your Santa Maria snorkel tour should be a stress free experience and life jackets can give you peace of mind, especially for people who are not strong swimmers or for first-time snorkelers. Once you are in the water, relax and float. Get used to your snorkel gear. Put on your mask and practice breathing through the tube. Sometimes it’s hard to remember to breathe through your mouth. Then stick your mask underwater and enjoy the view while you practice breathing with your mask underwater. In 10 minutes or less, you should be comfortable enough with your gear to take a slow float around the boat. And soon you will be ready to explore every nook and cranny possible! During your Santa Maria snorkel tour, it’s not unusual to find clouds of other candy-colored fish are plentiful at this lovely scallop-shaped bay. Santa Maria Bay has one cove, pebbly sand, and also an amazing snorkeling spot to southwest. Have the crew toss you a beer as you lounge in the sunshine afloat a Lily Pad, a large floating raft that can accommodate you and several of your friends. Or swim ashore for photos on the beach with your group. Our crew will gladly snap photos of you and your group. Join us for the best, Santa Maria snorkel tour available with Blue Sky crew.